Yarn is at the very base of our arts of knit and crochet, and therefore is of vital importance in the mission of the Center for Knit and Crochet, Inc. (CKC). It both inspires and contains our creativity. Where would we be without it? As a popular joke goes, probably doing 15-20 years in the state penitentiary, given the calming properties of knitting and crocheting. 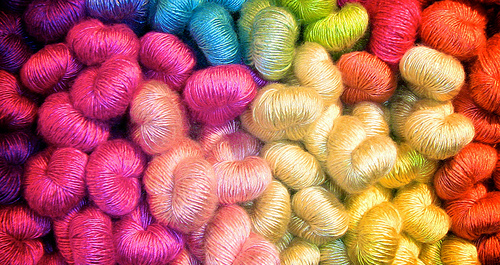 We’d love to hear how you celebrate I Love Yarn Day. 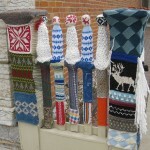 Are you teaching someone to knit or crochet? Will you start a new project? 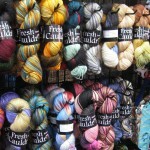 Will you pull out your favorite yarn from the stash or go shopping for it? And what is your favorite yarn anyway? Now please excuse me. I’m feeling an overwhelming urge to go roll around in my yarn. If I don’t emerge by October 17th, would someone please send an experienced knitter to my house with a clean shovel and a pair of size 8 needles?